Our pediatric surgical team works at two locations in Amsterdam (the Academic Medical center and the Free University Medical center). We started doing Nuss and Ravitch procedures for chest wall deformities years ago and with the increase of patients with pigeon breast and an increase of conservative treatment options for chest deformities we started our pectus care center in 2012. Our Pectus practice has developed rapidly since then. Over the years we shared our experience at international meetings and introduced the new non surgical and surgical treatments in the Netherlands. 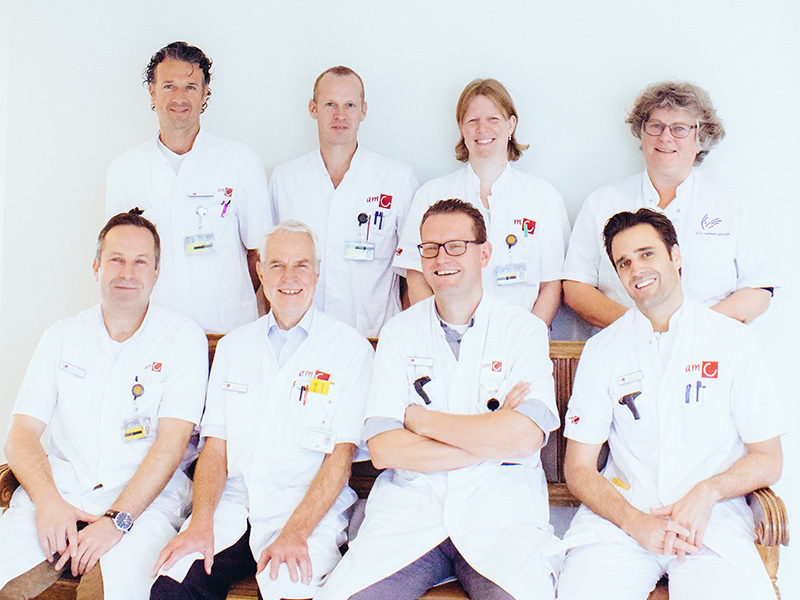 By conducting scientific research on the results of these treatments we hope to optimize the treatment of children and adolescents with chest wall deformities and try to contribute to an even better quality of care for pectus patients in the Netherlands. from left to right: Matthijs Oomen, Jim Wilde, Lideke van der Steeg, Christien Sleeboom, Justin de Jong, Hugo Heij, Roel Bakx, Sjoerd de Beer.